The first match at the Keilor ground was against the Bellevue club on the Thursday Queen's Birthday holiday on 24 May 1877 - the result of this match is yet to be uncovered. Other teams to play at Keilor in 1877 were the Carlton second twenty, Victoria Railways, Victoria United, Hotham Hill, Hotham and the Melbourne second twenty. The first season was deemed a success with the undoubted highlight being the win against the formidable senior club, Hotham, in the return match at Royal Park - Hotham went on to finish the inaugural Victorian Football Association season in third place behind Carlton and Melbourne. In 1880, a decision was made to update the club's uniform which many felt looked rather dull. 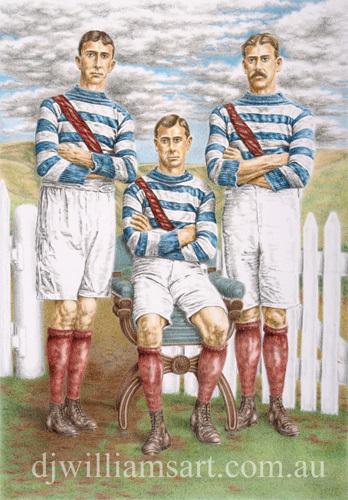 When the Keilor captain, Patrick Mc Shane, now led the players onto the ground they would be wearing a blue & white striped jersey with a red sash. The original black & white stripes would be retained in the colour of the players' caps. Mc Shane was Keilor's great champion in both football and cricket and was not always available to captain the club. He was now also an important part of the Essendon football team - a club that was going from strength to strength in the senior VFA competition. The three men pictured here in this 1908 portrait are from left, Bernard McGarry, Alex Wardill and Arthur Cave. Little is currently known of Wardill except that like McGarry and Cave, he lived in Footscray and played his football with both Keilor and the Footscray junior team. McGarry played as a follower and his name often appears in lists of best players as part of an invaluable pairing with Cave in the ruck. A relationship between the two Footscray men was fostered when Cave married McGarry's sister and it appears to have flowed onto the football field. When McGarry then settled in Keilor, a link with the football club was forever forged. Arthur Cave is clearly the most accomplished of the trio. He was born in Ballarat in 1880 and 22 years later was playing for Footscray in the VFA competition. After just one year in the seniors he left to play for the Footscray juniors where he went on to become a mainstay at the club. Cave's style of play was described as cool and confident. He played as a tall follower and was equally effective when placed forward. In 1905 his football future was under threat after a riveting machine he was working on malfunctioned and badly crushed his hand. Cave recovered fully over the summer months and mid-way through the 1906 season was chosen as captain of the combined VJFL team to take on a combined team from Ballarat. Whenever Cave was not required by the Footscray juniors to take the field he would make himself available to the Keilor club. Arthur Cave's daughter, Kath Borrell, has provided an account of what it took for her father to play at Keilor. She explained that he would catch a Cobb & co. coach from a depot in Ballarat Road that would take him through to the top of Green gully hill. From there, the coach would make a tentative descent to the bottom of the hill where the occupants would disembark in order to lighten the load. They would then walk in the coach's tracks as it climbed the other side, and on days when conditions were less than favourable, passengers were asked to help push the coach the final few yards to the top. In 1908, a room in the back of the Waggoner's Arms Hotel in Eagling Street would serve as the club's main dressing rooms. Once the players from both teams had changed into their uniforms they would make their way down the lane behind the shops to the ground. After the game the players, committee members and supporters would all meet back at the hotel - or across the way at the Keilor Hotel - where they would partake in food and beverages into the late hours of the night. Cave was often required to leave the festivities early for he yet had a long way to travel on foot before he was home. The trip would take him in the dead of night across the paddocks and through the creeks of where Keilor East and Avondale heights now stand until he reached his destination in Footscray.